About a year ago, I began a series of posts about a few of my ancestors who used to be buried at Arlington Abbey Mausoleum in Northern Virginia. The good news is that after learning that my ancestors’ remains were missing, I eventually was able to track down their whereabouts. I was contacted by another family historian recently who came upon my posts and now she too has been able to figure out where her relatives are buried. I’m re-posting this series here in the hopes that others who may have had family buried there might find the information helpful. I’m actually still struggling to get more documentation from Parklawn Memorial Park — they will not send me the interment documentation because of what they say are privacy concerns (even though I’m a direct descendant of all three buried there and the most recent of them died in 1930). I’m still trying — my most recent call to the cemetery resulted in a promise to send me a hand-written letter stating who was buried there, but that hasn’t materialized yet. I may visit the cemetery again and visit their offices in person to see if I can get further with them. For those who followed my series on Arlington Abbey Mausoleum (see Part 1, Part 2 and Part 3), you may remember that when I read up on the mausoleum and its unfortunate history of vandalism and looting, I learned that the remains of several of my ancestors were missing. Shortly thereafter, my half-brother remembered an old copy of our father’s will in which he stated that he’d bought a a burial spot for relatives bearing his last name at another cemetery. 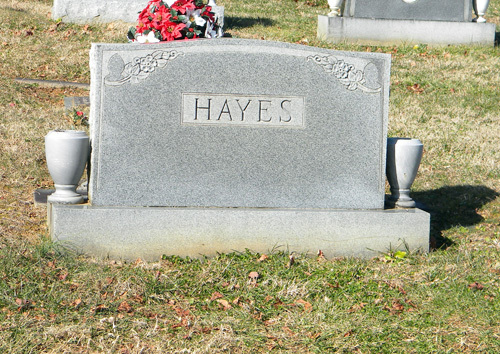 A phone call to Parklawn Memorial Park in Rockville, Md., confirmed that my paternal grandfather and his parents are indeed buried there, and I found out the exact location of where their remains can be found today. Saturday, I was in the area and paid a visit to the cemetery. When I arrived at the building described to me by the cemetery staff, my eyes lit upon my surname almost immediately. Bingo. But, I must say, the genealogist in me was a bit disappointed. 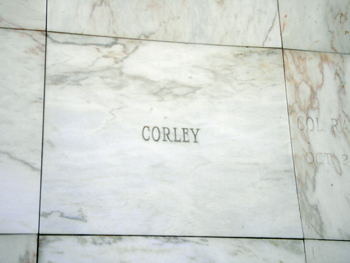 The name “Corley” is all that’s engraved into the marble face of their vault. I had hoped to see all three of their names listed. I harbored a twinge of jealousy after seeing the other vaults with more detailed information listed. Because this genealogist is a bit unsatisfied, I do plan to call back the staff at the cemetery and see if I can get a copy of the burial record. After all this searching, I want more tangible proof that all of them really are in there. Still, I was glad to get the chance to visit the cemetery and I’m also so thankful that this mystery is solved. Others whose ancestors were buried at Arlington Abbey are not so lucky. The remains found scattered there (or that are missing altogether) may never be sorted out. As I detailed in two previous blog posts (Part 1 and Part 2), the remains of three of my ancestors were once buried at Arlington Abbey Mausoleum in Arlington, Va. However, that site fell into disrepair decades ago and was subjected to vandalism and worse. When the Army Corps of Engineers tried to close the facility in the late 1990s, they couldn’t reach all of the families of those buried there. When I tried to find more information about my relatives, I learned that their remains were missing. As I said in my last post, it appeared that one of three things had happened: 1) a family member removed my ancestors’ remains to another location during a time when records of such removals were not recorded; 2) the urns holding the remains were stolen or destroyed; 3) the remains were among a bunch of unmarked urns found scattered inside the mausoleum, with no way to trace them back to the crypts to which they belonged. I called that facility when I returned home Saturday afternoon. After giving them the names and dates of death of the missing ancestors, the facility called me back in short order to let me know that they indeed have their remains. I now have their exact location and I hope to visit the memorial park soon. I’ve sent this information to the Army Corps of Engineers archaeologist who assisted me in my search for my missing ancestors. My hope is that now that we have found my relatives, this may help narrow down the possible identities of those remains found on the floor of the mausoleum. Continue to Part 4 (Tombstone Tuesday: Corley). In last week’s Tombstone Tuesday post, I wrote about Arlington Abbey Mausoleum, where my great-grandparents were interred in the 1920s. Over the following decades, the mausoleum’s owners abandoned the property when it failed to become profitable. Its government overseers were unable to keep a close eye on it and it fell victim to looters and decay. I came across an article that mentioned Scott Watson, an Army Corps of Engineers archaeologist, who in the 1990s had been tasked with locating next of kin of those interred at the mausoleum. The military was moving all of the remains out of the mausoleum in order to close it down permanently. I left a message with Watson and was able to speak with him this past week. Watson was able to verify that not only were my great-grandparents originally buried at Arlington Abbey, but my grandfather as well. I hadn’t been able to track down his gravesite yet, so this was a somewhat unexpected boon (I was hoping he had ended up in the same location, but hadn’t found any evidence of that yet). That is the good news — the confirmed burial locations of three relatives. The bad news is that they have all since disappeared. When the Army Corps of Engineers went in to Arlington Abbey to catalog the remains there and prepare them for removal, the crypt where my relatives’ cremated remains had been interred was empty. Watson made the following observations at that time: the shutter from another vault was propped up against the Corley vault, which was second up from the bottom of a six-vault-high stack (so relatively accessible). He noted there had been a fair amount of vandalism. Watson did say that between the 1950s and the 1970s, sometimes relatives of those buried at the mausoleum had removed the remains for reburial. The mausoleum sometimes kept records of this, but not always. There were no official records showing my relatives’ remains had been removed. Watson said that they had tried to trace the next of kin of the Corleys — but they put the most effort into tracking down families for whom they had remains to release. Finally, Watson said that they discovered several unlabeled urns containing cremated remains in a pile on the floor of the Abbey Mausoleum. They had no way to trace the vaults to which the remains belonged. These urns were reinterred in the cremation vault at National Memorial Park in Falls Church, Va. This is where all other unclaimed remains from the mausoleum were relocated as well. 1) Another Corley descendant removed the remains sometime between the 1950s and the 1970s. 2) The remains are among the discarded urns found in the mausoleum. 3) They’re just gone — stolen or destroyed. Watson apologized for not having better news or more details for me, but he’s given me a ton of information. He’s mailing me copies of the original interment documents and other information that he has available. It does sadden me that there was looting at the mausoleum, and that because of this, I may never find the final resting place of my grandfather and great-grandparents. Arlington Abbey Mausoleum was demolished in 2000, so I can’t even visit that location. But I have to admit that I’m a bit fascinated by this whole case. The story surrounding the mausoleum is quite incredible and I’m glad that I’ve learned as much about it as I have. I’ll report back if there is more to be gleaned from the records Watson is sending me. 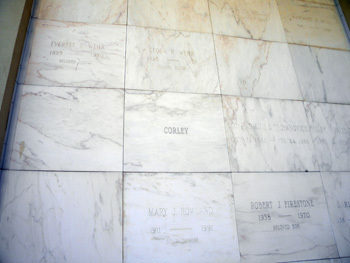 Several years ago, whilst investigating my father’s family, I learned that my great-grandparents (his father’s father and mother–Joseph E. Corley and Ida C. F. Corley), were buried in a mausoleum called Arlington Abbey in Arlington, Va., after they passed away in the 1920s. The mausoleum is no more, however, and all of the bodies have since been relocated. At that time, I assumed this was because the former mausoleum bordered Arlington National Cemetery, which from time to time expands to accommodate more graves. Grad school intervened and I had to shelve my family research. Only recently, did I pick this trail back up. It’s not a pretty one. A helpful ancestry.com member responded to a post on that site a few years ago to tell me that many of the bodies formerly located in the mausoleum were relocated to National Memorial Park in nearby Falls Church, Va., especially when next-of-kin could not be found. I called there this past weekend and was told that there is no record of my great-grandparents at that cemetery. Joseph and Ida used to live in Shelby County, Illinois, the location of a Corley Cemetery where a few of my ancestors and extended relations are buried. Thinking perhaps Joseph and Ida had found a way back home, I did some searching. I found an online list of the gravestones and Joseph and Ida are not listed. Scratch that possibility off the list. Since these were my only leads, I decided to do some more digging into the history of the mausoleum. I turned up a couple of articles in the Washington Times from the 1990s. Turns out that the mausoleum used to be privately owned, but was not very profitable. The owners turned over control of the facility to the federal government back in the 1950s, but the government didn’t have the resources to oversee it closely. It fell into disrepair and was the target of vandals and apparent satanic worshipers. Bodies were removed from their crypts and valuable items stolen. As disturbing as the above news is, the articles above include valuable information like the name of the company that originally owned the facility, the exact date when they turned over the property to the government, etc. Perhaps most importantly, I now know the name of the Army Corps of Engineers archaeologist who was tasked with investigating the families of the deceased to try and find next of kin when it was determined all of the graves had to be moved. I was able to track down his contact information over the weekend and I’ve left him a voicemail to see if he has any information about the whereabouts of my great-grandparents’ remains. He is not my only hope though. If I don’t hear back or he doesn’t have information about Joseph and Ida, I now have more details that I can use to perform further research. Luckily, I live close enough that trips to libraries in Arlington County, Va., or Washington, D.C., are feasible. I’d be curious if anyone else reading this has also traced relatives to Arlington Abbey — have you had any luck finding out what happened to them? Stay tuned for Part 2 next week. I hope to report back that I’ve heard from the Army Corps archaeologist.